The first formal event of the year for the King and Queen of Spain was held yesterday, the first Pascua Militar (a military ceremony) of Felipe's reign. Letizia repeats outfits a lot for this event; the formal dress code requires a long dress, but it's during the day so an evening gown isn't really the thing, and that often means special selections which are understandably worn again. This year's repeat was brand new just last year, a Felipe Varela teal number with motifs on the sides. It's a plain dress when you're standing straight forward, and an embellished one when you turn to the side, a two-for-one deal. What a bargain. A do-over dress leaves me free to contemplate the earrings, and I am intrigued. She's worn these before, in Rome in November last year (I feel really weird calling 2014 last year, by the way), but this is the first time I've paid them the attention they deserve. 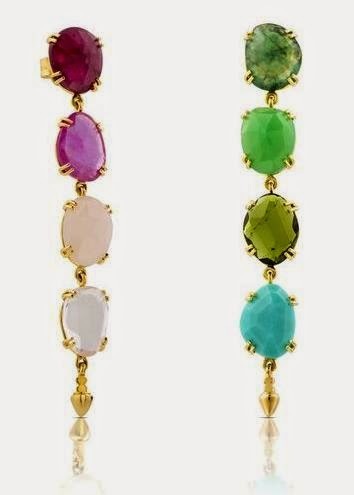 These are from Tous, a Spanish jeweler she wears often, and they have emerald, chrysoprase, green tourmaline, turquoise, ruby, opal, and pink quartz, all in 18-carat yellow gold. Half a rainbow for one side of the head, half for the other. LOVE. The Earring Queen wins again. Video, above. Click here for a gallery.